Jake dropped his old backpack in amazement. He couldn’t believe he was actually here at the Floating Hotel of Venus. ‘Wow! This is the best prize ever,’ a voice said. Jake turned. It was Rory, who had just arrived from Mars with his mum and dad. And Rory was right – the hotel was even more incredible than Jake had heard. The foyer was round, with gleaming bronze pillars and walls that shimmered bright yellow like a golden waterfall. Jake and his friends are on Venus staying at the unimaginably luxurious Floating Hotel of Venus courtesy of a reward for saving the world from being taken over by robots. But it’s not long before a new mystery finds them. The action quickly moves from deciding which luxury treat to have first, to who to trust and how to find out just who has dangerous secrets. There are fast vehicles and near misses, red herrings and volcanoes to be navigated. And as always, time is running out before catastrophe ensues. Chapter headings are illustrated and there is a flip space race happening across the bottom of each spread. As if there’s not enough to be had on Earth, Jake and his friends, Rory, Henry, Skye and Milly, take the action off-Earth and into space. They are trained in space driving but more than that, the friends between them have the skills and insights necessary to solve all manner of mysteries. They don’t always get it right first time, but with teamwork, they consistently out-think and out-manoeuvre their foes. The stakes are high, and there is plenty of high-tech equipment at their disposal. These fast-paced adventures are ideal for newly independent readers. Whoosh! A robot in a jet-powered winged suit flew straight past Jake and his friends. It looked like a cross between a person and a plane. Jake could smell the burning fuel as the robot shot upwards. The heat from the jets was so intense it almost burned the skin on his face. Zoom! Another robot came out of nowhere. Jake jumped as it roared by, making him spill his super-fizz swurpie all over himself. The rainbow-coloured fizzy bubbles started popping all over his pants, leaving a wet, sticky mess. ‘Great!’ he mumbled, pulling an instant-dry cloth from his shirt pocket. He was busy trying to wipe his pants clean when Rory nudged him. Following his gaze skywards, Jake’s jaw dropped open. Jake and his friends are attending the Robot Games, arena spectacular competitions and displays by the most advanced robots ever developed. But something’s is wrong with their cyborg friend Henry. It could be that he has eaten too many of the weird popping snack, Gob Pop, he seems to love. They’re not sure what’s going on with him so they take him to the nearby medical centre, despite having to miss some of the Robot Games events. Black and white images appear with each new chapter and across the bottom of each opening. 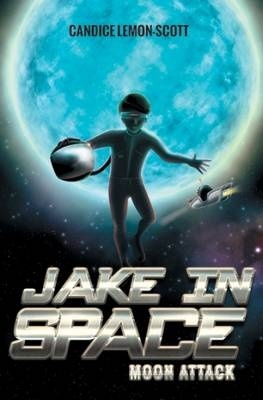 ‘Jake In Space: Robot Games’ is a third instalment in a series for young readers from New Frontier Publishing. Three more titles are to be released soon. Each adventure involves Jake and his friends in a mystery that only they can solve. Each is set in a future where robots are familiar and children control their own space cars. Characters require clear-thinking skills and imagination. Action is fast-paced and there are plenty of wonderful gadgets to keep readers engaged. Recommended for newly-independent readers. Remedial Space Car Driving School! Remedial! Jake thought. Why didn’t Mum and Dad just put a big sticker on my forehead that said ‘Universe’s Biggest Loser’? He scrunched the letter up in an angry fist and threw it back at his parents – except the letter stuck fast to his fingers. He tried to shake it off but the paper just seemed to hold tighter to his skin. ‘It’s Slooper Goo. We thought you might react this way ,’ Mum said, shrugging. Jake is mortified. His parents have signed him up for remedial driving lessons. Everyone at school will know. But he’s tried every driving instructor on Earth and now he’s about to start on the moon. The instructor, Gradock, is so confident that all his students will graduate with their licences, he offers a money-back guarantee. But all is not well on the moon and before long Jake can tell that something dodgy is going on. As his course progresses, he is determined to not only pass, but to solve the mystery. ‘Moon Attack’ isa sturdy blue and silver covered paperback with illustrations beginning each chapter and a border along the bottom of each page. Moon Attack is the first of three ‘Jake in Space’ titles slated for 2014 release. Moon Attack introduces the reader to a futuristic universe where it’s entirely feasible to do your driving training on the moon. And it’s accepted that you should be driving to school long before you are eleven (as Jake is). Adventures unlimited by gravity – what’s not to like? Throw in a mystery to solve and ‘Moon Attack’ shows that there is fun to be had on the moon in space cars, both inside and outside the space centre. There’s a nod to examination anxiety which it seems has contributed to Jake’s previous licence failures, but it’s not laboured. Moon Attack will appeal to confident young readers and to older readers not yet ready to progress to longer novels. Recommended for lower- to mid-primary readers and beyond.